Most New Yorkers recognize that drunk driving is treated as a serious crime, but assessing just how severely a conviction could impact your life is difficult given the complexity of current DWI laws. The passage of Leandra’s Law and other changes have made it more critical than ever to be fully informed and well represented if you have been arrested for DWI or another alcohol-related driving offense. Relying on a New York City drunk driving attorney who focuses on “quick pleas and quick fees” could be a mistake you regret for many years to come. 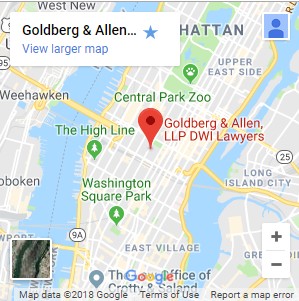 For an honest, thorough assessment of your DWI/DUI or DWAI case and proven representation in negotiations or at trial, contact Goldberg & Allen, LLP, by calling 212-766-3366. Our experienced defense lawyers can explain what you are up against — including all aspects of driver’s license suspension, mandatory use of ignition interlock devices and other penalties — to help you make the best possible decisions for your future. We will investigate and pursue all aspects of your case to identify the best defense strategy or negotiating approach. 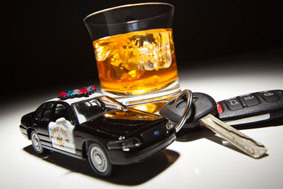 In many situations, it is possible for someone facing a non-aggravated DWI to plead guilty to driving while ability impaired (DWAI), a traffic infraction. This option is generally not available to people accused of aggravated DWI. While a plea agreement is and always will be the last resort at our law firm, it is nevertheless important to understand this limitation. Given these constraints, it is even more important to have lawyers on your side who will challenge the evidence and seek a dismissal of the charges. As former high-level prosecutors who also have decades of criminal defense experience, we are well versed in this very technical area. Widely respected attorney Gerald Allen has achieved many positive outcomes including DWI acquittals at trial based on problems with evidence and police procedures. We frequently receive referrals from other lawyers and past clients, and we have earned respect among court officials and adversaries alike. Before you make critical decisions about your DWI case, we urge you to take advantage of counsel from a lawyer who trained many prosecutors and police officers. Please contact our firm today to request a free consultation. Call 212-766-3366.